Curry bread is a popular Japanese food. 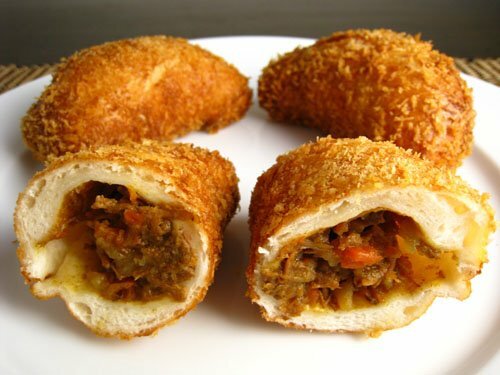 An amount of Japanese curry is wrapped in a piece of dough, and the dough coated in bread crumbs, and deep fried. On occasion it is baked instead of deep fried, but deep frying is the most common method of cooking. Curry bread is usually found in bakeries and convenience stores. Kare pan man is one of the superheroes in Anpanman. He has a head made out of curry bread.